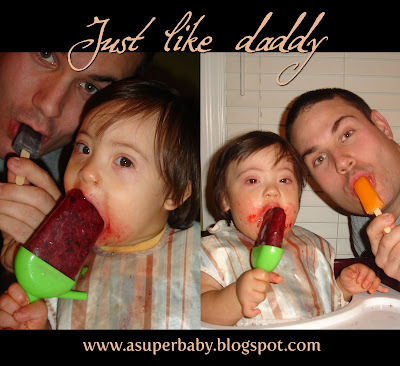 A super boy fighting against ASD & T21: Eating popsicles is fun! We have realized that Tommy as any other kid like to do things in his own way. We are looking for fun ways to do his therapies because he doesn't cooperate if they look like therapies. As his PT says: "He has a mind of his own". We are working on strength his oral motor skills and popsicles are a wonderful therapeutic tool to increase oral stimulation and awareness. 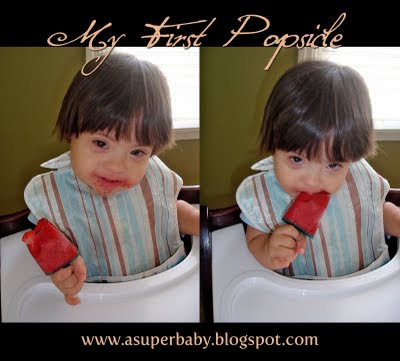 Therefore, we are giving Tommy home made popsicles (sugar free) and he likes them so much, that he gets upset when I tell him "it is all done". Oh boy! If he sees daddy eating a popsicle, he wants one, too. He is in the stage toddlers imitate their parents. Well, Tommy wants to do everything just like daddy. Rosa, What a great way to stimulate Tomi! He really seems to enjoy his special treats. You and your husband are wonderful parents! Keep up the good work!